Ahead of her company’s latest project, and aptly celebrating International Women’s Day, we spoke to Artichoke’s Director Helen Marriage about art, politics, closing London, and the Suffragette movement. Awarded an MBE for her service to the arts in 2016, and previously the Director for Salisbury Festival, Helen Marriage has had a very vibrant career in the arts and events. Now Helen is the Director of the “small company with big ambitions” and even bigger projects, Artichoke, which she founded in 2005 with Nicky Webb. Since its creation, Artichoke have moved from strength to strength – and their public domain art projects have only grown bigger and bigger. Ahead of International Women’s Day, we spoke to Helen to find out more about Artichoke, its projects and ethos, and also to hear about their newest, upcoming venture that will take place on the June 10th: PROCESSIONS, which marks the centenary of the first time (some) women in the United Kingdom were able to vote. Conversation begins as I wonder where the inspiration for such a unique company came from. “I had always worked in the arts as a producer and director, and loved the work of this one particular company Royal de Luxe, who are based in France,” Helen explains. “I wanted to create a context for them to come to Britain – which was very difficult in those days because nobody could quite imagine doing all the things you have to do to accommodate work of that scale”. Helen explains that Artichoke was set up “in order to make that one project happen”. 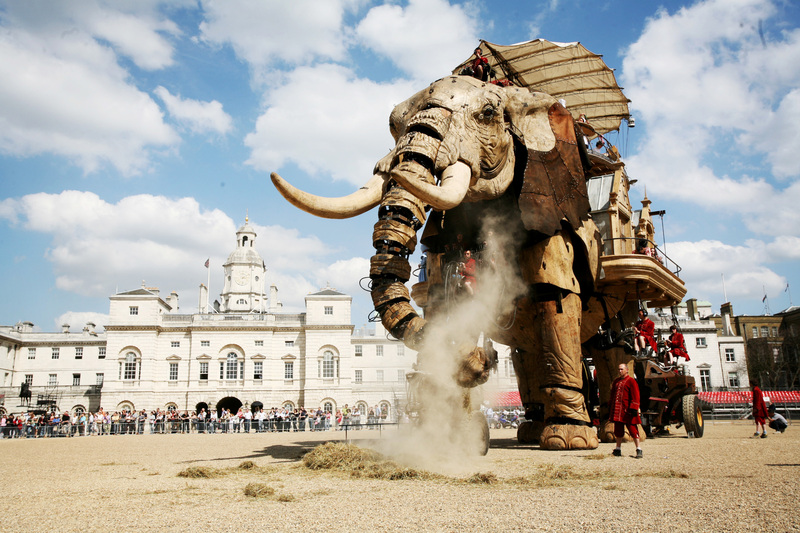 Called The Sultan’s Elephant, it took place in London in 2006. But, she continues, “it took me seven years to negotiate the permissions and the money”. I mention that Helen must have had a real passion for the project, in order to persevere for seven years and see it completed. She shrugs. “I just felt that it was important, I was really keen that we could prove that we could what they needed in order to create a fantastic platform for them”. “It was amazing when it did happen,” Helen continues, “and it obviously changed cultural policy; people understood that work outdoors didn’t have to be just a juggler and a jazz band, and on the back of the success of that one project, the Arts Council approached us and just asked us if we would do more things in the public realm – so that’s what we’ve done”. With The Sultan’s Elephant, Artichoke became the first company to shut London for an art event. “I mean, London does shut itself down often,” Helen concedes, “but usually for sporting triumphs or military victories, or the Queen or President Trump - all those things that we think are normal. But the idea of doing it for an artwork was very, very odd; that’s why it took such a long time. People had to think their way around what was possible and what was desirable”. Considering Artichoke produced The Sultan’s Elephant over ten years ago, I wonder if it has made things easier going forwards. It seems that Helen agrees; “I think there are a set of reference points,” she muses. “It’s certainly easier for us because we have a track record. There’s been a building of credibility and friendships and networks, so now it takes us about 2 years to complete a project”. I ask where Artichoke gets their ideas for these incredible, massive pieces of art; Helen responds that the ideas can come from one of three different ways. 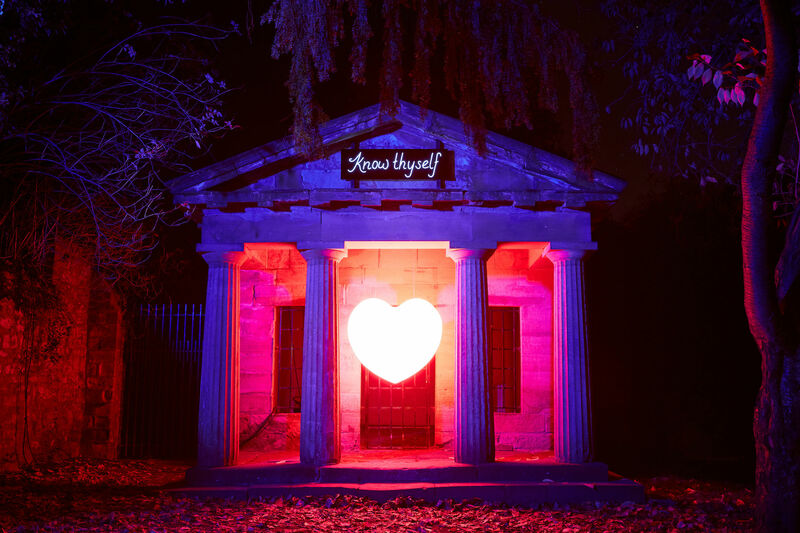 “Sometimes a city or an event – like a city of culture– will come and say ‘we love what you do, could you create something for us?’ Other times an artist has an idea. 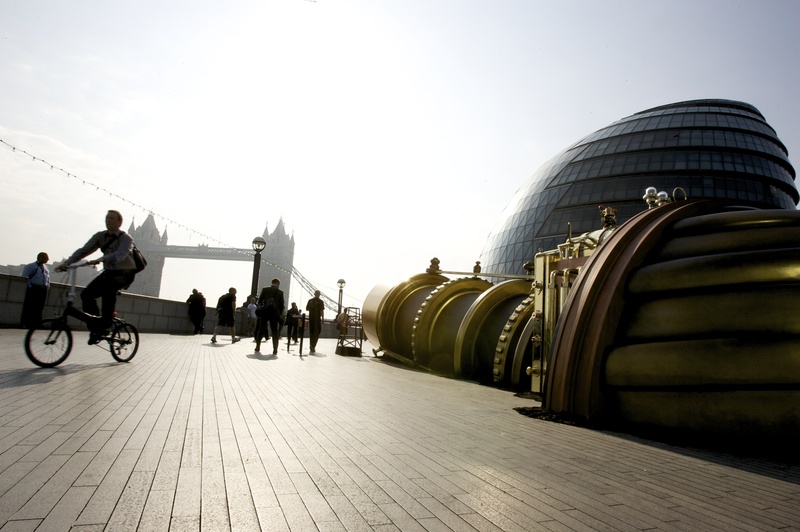 For example, Anthony Gormely’s One and Other; he was commissioned by the Mayor of London to make that piece. He came to us and asked if we could produce it for him”. “It’s either an approach by a space or an artist, or sometimes I just think of something to do and then we do it,” Helen admits. Her ideas “often connect with a place and an artist – you can put them together”. She explains that for her, “the moment of inspiration is always the most exciting, adrenaline fuelled bit – when there is a brilliant idea and I know how to make it work”. It strikes me that, with such expansive and public art projects, Artichoke must have its fair share of challenges. “There are a number of hurdles that you have to jump,” Helen confirms. “One of them is the permissions; my venue is not a dedicated art space where I can do what I like. I’m not licenced to do anything in the public domain. When we did the commemoration of the Great Fire of London, David Best made this massive recreation of 17th Century London which we then burnt on the river – there’s no blueprint for that. So a lot of the issues are around persuading people to let you do stuff that seems to them to be rather extraordinary or dangerous”. “One of the other things is the money,” Helen continues. “As more and more people want to come [to our events], you have to resource their safety, wellbeing and security. It becomes a huge challenge to pay for all of that.” Most of Artichoke’s events are free to the public, so in comparison to most projects (which, as their success grows, they make more money) “for us, it’s the opposite – the more successful we are, the more it costs us because we’re looking after many more people”. 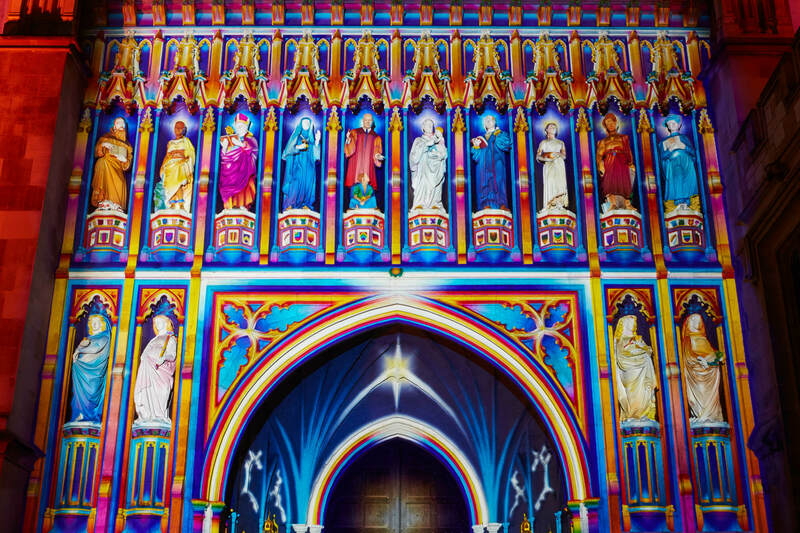 This brings Helen to explain how much effort went into making London safe for the Lumiere Festival, which took place earlier this year. “Policing or securing central London is a massive job… I didn’t actually notice the huge amount of money that we were spending making sure that they were safe! We tried to make it work in such a way that it didn’t feel as if you were being herded. It should have felt quite free”. As a visitor to Lumiere myself, I can happily confirm to Helen that it certainly did feel unrestricted. 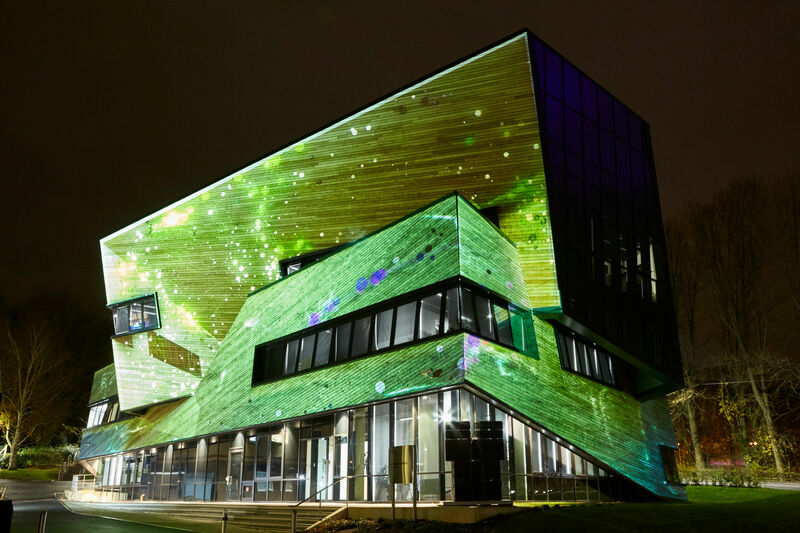 Continuing the discussion on Lumiere, I ask Helen to elaborate on the project – after all, it is one that Artichoke continues to put on in Durham every two years. “It’s an idea that translates very easily,” she comments, “People can really understand what it is”. Plus, it seems that Durham loved it so much after the first show in 2009 that “they announced we were going back in two years’ time – and yes, we’ve been going back every two years since”. Artichoke always makes an impact with their projects, and I question if this is done on purpose. Helen says that it is: “It’s two things,” she clarifies. “One is about the audience’s access to work. If we can work with artists to create things that sit in the public domain, then maybe people who won’t visit a gallery or a theatre or an arts centre can encounter it, and decide whether they love it or hate it. At least they’re noticing it, and it has an impact in their lives”. “The other thing is more political; the occupation of public space by its citizens,” Helen says passionately. “There’s a whole impetus behind what we’re doing to show that there’s a positive side to disrupting daily routine. London [for example] is a massive machine; we move from work and home, and transport is all geared towards that. The transport people are very fearful when we turn up ask to close the road,” she laughs, “but the number of complaints that they get are tiny compared with the number of complaints they get on a normal day, because people are enjoying what’s on offer. The cause of the disruption is something that they like, and they don’t mind”. Next, I ask Helen why Artichoke focuses solely on using art work to disrupt daily routine. “We do get enquiries from sporting events and ad agencies,” she admits, “but for me, I can’t justify that – there has to be something uplifting, challenging or meaningful in the work that we do. It’s a rarer thing for the arts to step out of the control of the dedicated gallery; you have to be quite brave to take on the public. It always makes me nervous when we open, because in the end it’s my taste; it’s me saying to a million and a half people ‘I think you’ll like this’ with absolutely no sense that actually they will”. However, Artichoke doesn’t leave the public completely in the dark about the work before revealing it on an opening night – they also try to work very closely with local communities. 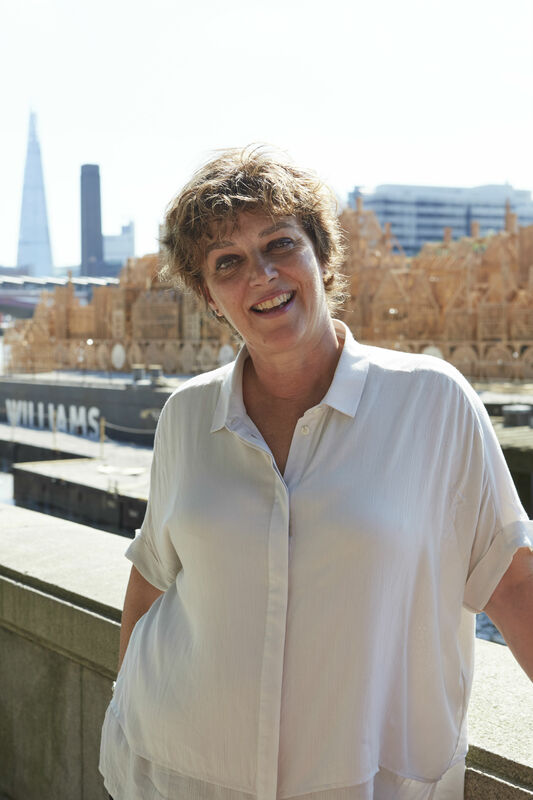 “In London’s Burning,” Helen elaborates as an example, “there was a big, dedicated community outreach programme where young people who weren’t necessarily in education or work were learning laser cutting, team work, going to work on time – they were doing something incredible. They were learning directly about their own history and the history of the city. A lot of the Muslim girls in their hijabs were operating chainsaws and saying ‘no one in my family ever lets the women do this’, so that was really great – all kinds of education were taking place”. “An artist was talking to me about two years ago about how we should mark the centenary of women – some women – getting the vote, and we were talking to him about to build on that. It was very interesting to be working on it two years out, and see everybody doing exactly what we were trying to generate [with the current protests and marches]. When people took to the streets, there was a sense in which people thought they’d invented the art of protest - but actually, if you look back at your own history, there they were a hundred years earlier doing exactly the things that we are”. I wonder if Helen believes that PROCESSIONS will still have the same impact as Artichoke thought it would two years ago, considering all the recent action. 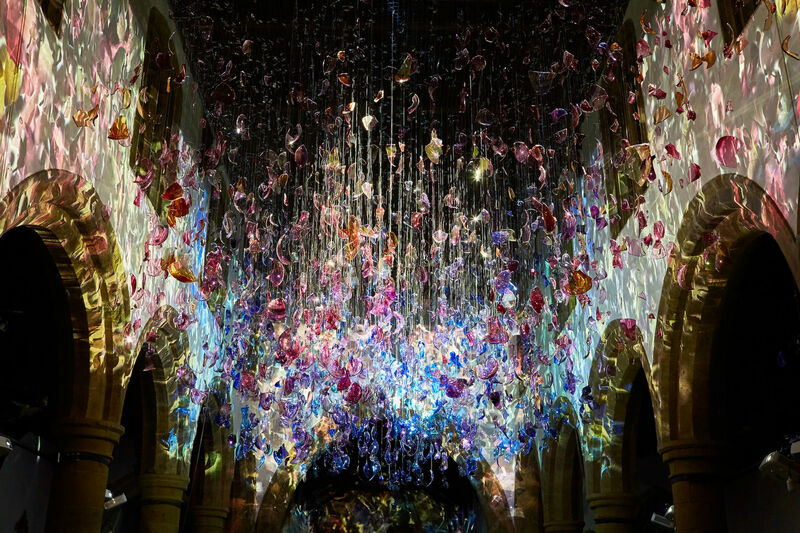 She believes it will; “I think these things are incredibly moving, and I think that our way of mobilising people will be well applied to this participatory work. Women* all over the country are excited to be part of this incredible thing”. PROCESSIONS will talk place “in all the political capitals - so Belfast, Cardiff, Edinburgh and London - and absolutely it’s about politics”. By inviting the public to march, PROCESSIONS will be Artichoke’s first major participatory event – but that’s not all. 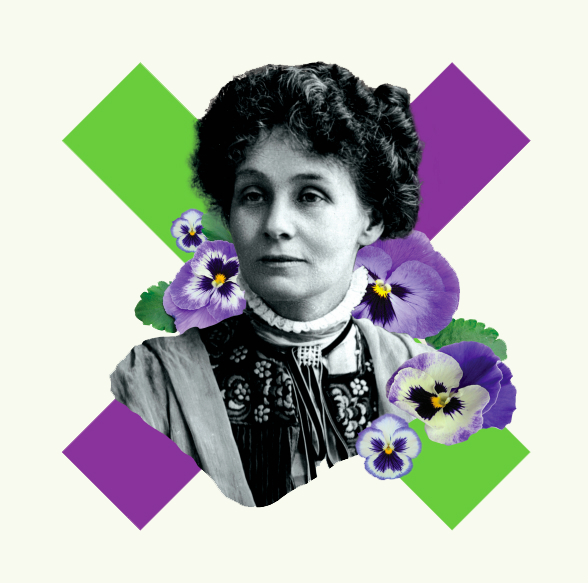 “We’ve commissioned 100 artists and there are 100 banners to be made, each by a different artist with different community,” Helen continues, “and we’re working with about 5,000 organisations to get them to spread the word, to encourage their members to turn up and perhaps make a banner in the tradition of the Suffragette banner. There’s this massive effort going into making this into something that is really inclusive and really about everybody”. With only three months to go, I ask Helen how she is feeling about the ins-and-outs of creating such a huge project, which has such a deep meaning behind it. “Nothing’s ever smooth,” she laughs, “but I think that the logistics will be determined by the numbers – depending on how many people decide to turn up. We’ve got a registration process so the question will be ‘at what point do we really have a sense of how many people are coming to each of the cities’? The logistics will fit around that”. Helen is encouraging everyone to register on the PROCESSIONS website to become a part of this monumental day. “I think it will be exciting,” she mentions, thinking to the future and what the June 10th might hold. “It is an artwork – it’s not a protest – and there will be these moving flags of colour throughout the city. It’s all about the image.” There is truth in that statement; PROCESSIONS will certainly be a spectacle that we can’t wait to see. PROCESSIONS takes place on June 10th 2018. For more information, or to register your interest, please visit the website here.